Developers want to build condos at the site of the University of Maryland golf course, a plan that doesn’t sit well with some local golfers. Dion Jordan makes the trip to the course from D.C. twice a week so his son can learn the game. Maryland senior Phillip Fiore said the course is a big part of his college experience. Both would hate to see their beloved course shut down. Supporters of the development contend it will ease traffic concerns, creating a direct pipeline to the university and a way to bypass Route 1. Opponents say it’s all about money. Maryland can’t sell the land, but it could lease it. 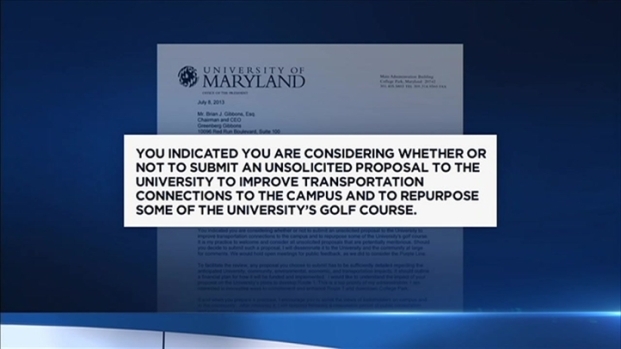 The fight to save a golf course at the University of Maryland is heating up. Developers are hoping to use the land to build a condominium development. Prince George's County Bureau reporter Zachary Kiesch has mixed reaction from golfers and those around the university. Some agree the development is needed, but not at the expense of their golf course.